Bringing a child into this world is one of the most exciting moments of our lives. Preparatory shopping for his/her arrival is an important step to making our world suitable for the new member of the family. One of the most important items to be obtained is a changing table. With an impressive 2,400 dippers to be changed in the first year offers you’ll want to make sure that the table of your choice offers the best in usability and safety. With a better understanding of your options, you can choose the best baby changing table on the Market. Interestingly enough changing tables have not always been as widely accessible as they are today. In the mid-80’s Jeff Higger invented and marketed the first fold-out changing table for public restrooms. This invention was designed as a way to keep moms and babies off the floors of dirty restrooms while changing diapers. When the invention has first introduced no business would listen to Mr. Higgers until he changed the picture on his brochure form a mother holding her child to a mother kneeling on a dirty bathroom floor while changing her infant’s diaper. Mr. Higgers quickly became a millionaire. Before delving much into the details of the best baby changing table, it is important to understand that a changing table is simply a designated area for the newest member of your family to have his/her diaper changed. Most tables will offer some type of storage space for the necessary items such as diapers, baby wipes, lotion, and baby powder; and will be a reasonable height to allow an adult to change the diaper without hurting their back. What are my options for a changing table? 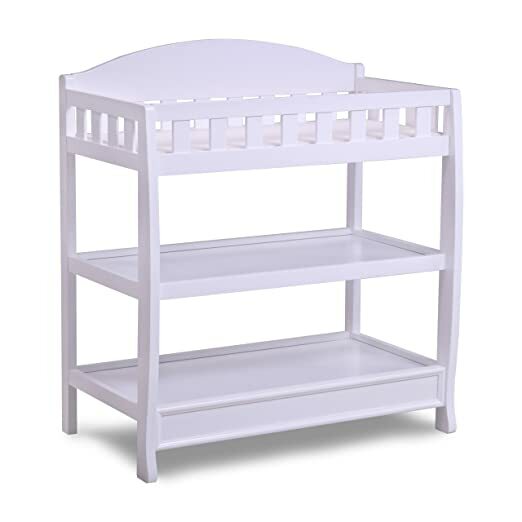 Changing tables come in a variety of shapes and sizes the basic changing table which will typically have some type of storage space is priced from $60 to 100 dollars. The combination changing table which also functions as a dresser runs anywhere from $200-$500. A pad for your child to lie on is a common accessory for both of these options, running anywhere from $20-$99. It isn’t hard to imagine that having a stable surface on your baby’s changing table is important. If for instance, the table includes wheels for easy mobility, it is important to assure that the wheels are locked in place before beginning. 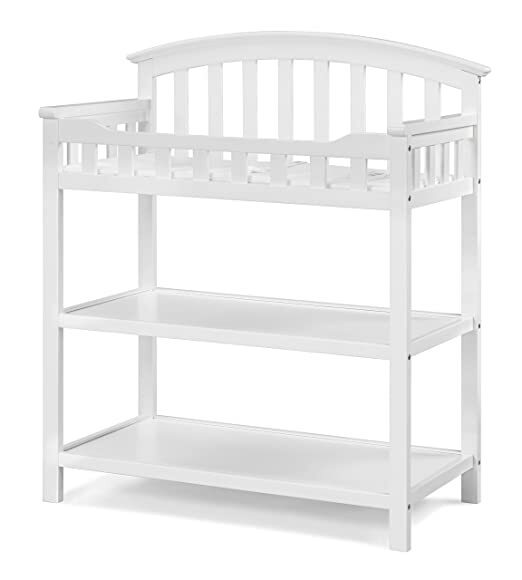 A baby’s changing table should have plenty of storage for all that is required diapers, wipes, and lotion is only the beginning of a comprehensive list. It is also useful to have room for a favorite toy so that the child is less inclined to fidget during the process. Because children only require regular diaper changes for the first two or three years of their lives it is good to consider alternate uses for your purchase; such as clothing storage or shelving for toys and books. For added security, it is good to have a belt that can be strapped around the babe’s waste while on the changing table. This strap, however, does not take the place of an adults hand on or near the baby as he/she is being changed it is important to always be aware of your child in case of an accident. Having discussed some background information, let us now look at some of the best baby changing tables out there. The Graco Changing table comes highly recommended on Amazon with a 4.6 overall rating and a price ranging from $94.61 to $114.35. The item weighs only twenty-nine pounds with dimensions of 37 x 19.2 x 44 inches. This table is composed of two shelves and the changing surface; each shelf has approximately an 11.5’’height. The changing surface of this table is surrounded by the railing to help secure your child. This table also comes with a changing pad and strap to further secure your baby. Users have reported that the Graco table is easily put together some saying it only required 10 to 15 minutes of effort. There is also a general consensus that the table is sturdy and looks very nice once assembled. The Leni changing table is relatively new to amazon however so far it has a 5 out of 5 star rating with a price of $$$. This dresser/changing table is 142 pounds and offers dimensions of 57 x 17 x 5 inches.This multi-functional piece of furniture can serve you and your family for many years; as it offers a removable changing table and six drawers of storage for your child’s growing needs. This baby changing table is an excellent choice if versatility is your goal. 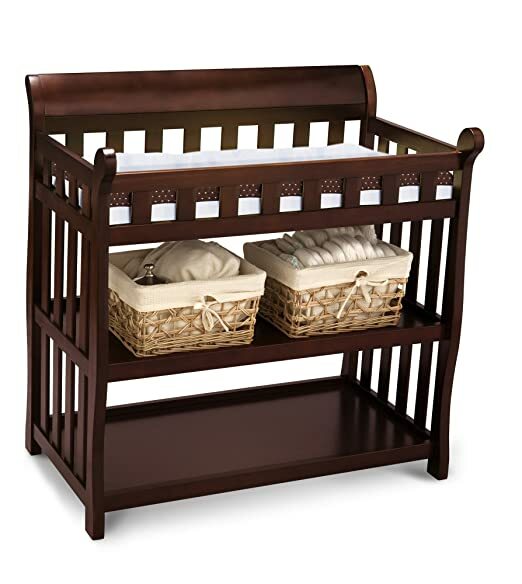 The Shelby crib and changer offers an all in one option perfect for the growing family who needs to conserve space. The changer sports one shelf, one drawer and a changing surface. In addition, it offer three additional shelves in the back for long term storage. At a surprisingly light 92 pounds, this item can offer an impressive amount of mobility. The product’s dimensions are 72x 31.2 x45.2 inches. Many have reported that while they are in general very pleased with the product it is very difficult to assemble. Some have even complained that no instruction set came with the furniture. 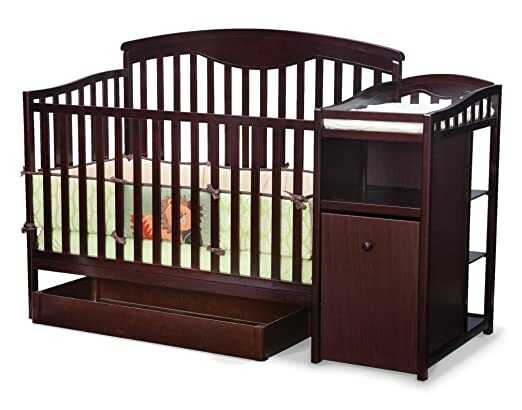 Certainly this baby changer and crib is the perfect space saving option. 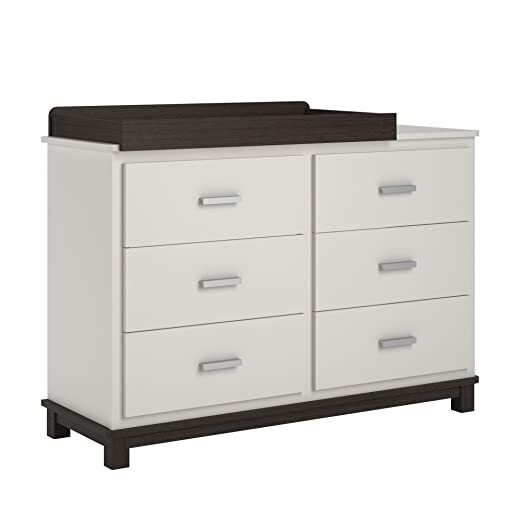 This Delta changing table running $115.23 has a classic look. It has twolarge shelves and a guarded changing surface. This table weighs 36.6 pounds and has dimensions of 38x 5.5 x 23 inches. With286 reviews this product maintains a 4.6 out of five star rating. The users suggest that while this is a very good bang for your buck some difficulties in setting up can be expected, and at times quality may be a little shy of what is expected. However, the vast majority of users were overwhelmingly satisfied with the products sturdy build and beautiful design. The delta eclipse changer is an exceptionally good option with a very competitive price tag of $100.99 with amazon prime. It weighs just 36.4 pounds and offers two large shelves with lips around the edges and railing on the sides, and a beautifully designed changing space with railing for protection. This product very likely represents one of the best babe changing tables on the market. The Delta Children Eclipse Changing Table is my top choice it offers a beautiful design that can be used for storage once your child is a few years older; it is very stable and includes both guard railing and a belt to keep your child safe. With its extremely competitive pricing, this exceptional baby changing table has everything a new mother will need. By any standard, the Delta Children Eclipse Changing Table ranks as the best baby changing tables ever to be designed.